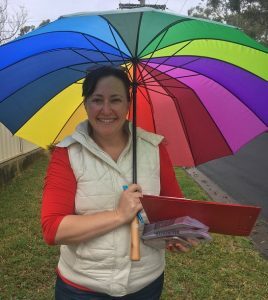 Sally Quinnell: after a year of doorknocking, the Labor candidate in Camden is on her third pair of shoes. In the 12 months since Sally Quinnell won Labor Party preselection for the seat of Camden, she has spent most weekends campaigning the old fashioned way – door knocking and talking to commuters at train stations. And while Ms Quinnell admits she has enjoyed meeting the people who may vote to send her to Macquarie Street as the next member for Camden, her feet, if they could speak, would beg to differ. She’s now on a third pair of shoes after all the doorknocking throughout Camden, including Oran Park, Mount Annan, Currans Hill and Harrington Park. On a more serious note, her doorknocking has revealed that building new schools and fixing our current schools is high on Camden’s priority list. 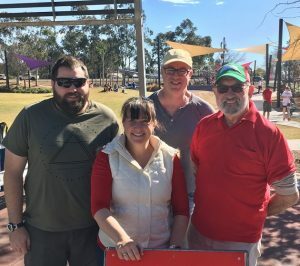 “I have really enjoyed meeting Camden families and having a chat about issues that are affecting them, what we love about Camden, and what priorities they think the next NSW Government needs to focus on,’’ says Ms Quinnell. “When people realise that there are over 100 demountables scattered across Camden’s schools, they are horrified. Local residents are also upset it has taken this government so long to build schools needed in such a growing area as Camden. “Oran Park Primary had 11 kindergarten classes this year and 20 plus demountables,’’ she points out. “Camden’s population continues along the trajectory that will see it contain 220,000 people by 2036, and residents are rightly concerned that if not managed well, this growth will destroy the rich European, Indigenous and environmental heritage Camden is blessed with. The other major issue in Camden is the proposed route for the M9 Orbital, with claims the route was chosen by bureaucrats sitting in their inner city officers looking at Google maps. Ms Quinnell out and about in Camden. “The pain and anguish that this government are putting people through in regards to the Orbital proposal is just awful,’’ Ms Quinnell said. She says another issue raised regularly is the lack of public transport, especially the lack of trains and parking at Leppington station. “People are at their wits end in regards to Leppington train station parking,’’ Ms Quinnell said. “Commuters are forced to park down side streets and run the prospect of getting fined. “That this Liberal NSW Government has been in power for eight years and not built one new car spot at Leppington, let alone begun work on extending the train line to Oran Park, is just another example that they do not see Camden as a priority. With five months to go before the election, she says the door knocking and early mornings train stations have only just begun. “At a time when there is so much chaos in politics, with some people thinking that they can waltz into parliament because they have mates there, I am really determined to show everyone that I want to be a strong voice for Camden. “I am a mum with kids in local schools, a local small business owner and a community minded person who loves nothing more than catching up with friends, new and old, in Camden’s great coffee shops. “I will always put Camden first and I will continue to be out every week to convince Camden residents that they have a real choice at the next election,’’ says Ms Quinnell. Is this the end of large blocks at Glen Alpine?